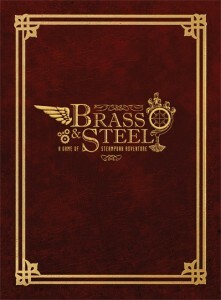 Brass & Steel is a complete role-playing game published by Pamean Games. Welcome to the thirty-seventh Designer’s Diary, a regular column where designers are given the opportunity to take readers on an in-depth ride through the design and development process of their system, setting, or product. If you’d like to share your product in the Designer’s Diary column, send a message to aaron@roleplayerschronicle.com. Brass & Steel is a steampunk-themed roleplaying game set on an alternate Earth beginning in 1905. Brass & Steel uses a custom rules system specifically designed to let the story drive play without getting bogged down in complicated rules. We also wanted to design a hybrid system which would work equally well as a tabletop game or a LARP, using exactly the same rules. The idea is that players can be sitting around playing the game and when it seems appropriate, simply stand up, bring their papers and a die, and start LARPing. We aimed the game more at rough and tumble characters, who have epic adventures in the colonies and rougher edges of the world, but we also made sure that players who’d prefer to spend their game sessions engaged in subtle social diplomacy were supported by the rules. Similarly, we tried to make it possible to build characters from any social class or background. Players who want to be guttersnipes can do so, and will have an interesting gaming experience, while those who wish to be the pampered children of the industrial elite can do so as well. In addition to the goggles, airships, and snazzy brass-plated pistols (all of which do appear), there are two supernatural aspects to the game. A type of magic, called Arcanism, has been in the world since time immemorial. Basically it works by doing cruel and unusual things to the laws of physics, and by pulling things into and out of other dimensions. It’s not very subtle magic but it can be quite powerful. Fundamentally it is also terribly dangerous, and characters who dip their toes in the fountain of power too often are apt to discover that they’re now covered in scales, glow in the dark, or wander off occasionally to have their own dark adventures. We also incorporated a somewhat more subtle version of the supernatural in the form of lucid dreaming. With the right alchemical elixir and training, characters can access the dreamscape and visit both the dreams of individuals and the realms created by the collective unconscious of humanity. To give characters who specialize in dreaming something to do while they’re not asleep we added the ability to project dream images through the collective unconscious, which allows skilled lucid dreamers to create some nifty illusory effects in the waking world to terrify or entertain. We have been playing roleplaying games for a long time, very nearly since the beginning of the hobby, and have played using many, many different systems. A couple of years ago we started thinking about what we were looking for in a great game – simple, flexible rules; a compelling setting; a new take on magic or something like it; and maybe a steampunk theme. We looked around and didn’t find anything quite like that. We’d tossed around various ideas for a game of our own over the years so this seemed like a good opportunity to see what we could come up with. There are quite a few, and they come from many different genres and mediums. First of course are the games we’ve played. We thought a long time about what we liked about our favorites and wanted to capture some of that into our own game. For example, we’ve always liked how simple yet seemingly complete Call of Cthulhu’s resolution system is. We also liked the way some games used extra tools for flavor and variety – like the way Deadlands uses poker chips and playing cards in creative ways to make the game more fun to play. Games with systems for social networks like Shadowrun and Burning Wheel were also an influence, as we like to stress the idea that the player characters are not alone in the game world and exist within an ever-shifting web of contacts, allies, and antagonists. In addition to being gamers we are all huge science fiction nerds, and that has inevitably influenced our game. We hadn’t delved too deeply into steampunk fiction when we started designing the game. (We like to think of ourselves as much better versed now.) We have a solid grounding in a lot of other genres so we tried to think creatively about how we could bring our many influences to bear to build an elegant game set in a unique world full of tension and adventure. A lot of other reading material influenced the game as well of course. Everything from papers and books on social revolutions in the period to college classes we’ve had in pre-Columbian America and central Asia; from naval history to the architecture of English country houses; and so very much more besides are in there somewhere. We’ve each had a fairly quirky set of historical interests, and you’ll see bits and pieces of each of us in the game. As mentioned previously, when we started Brass & Steel we liked what we’d seen of steampunk, but we were not deeply immersed in the subculture. We actually avoided reading steampunk fiction in the early phases of development to avoid undue influence coming from a handful of sources. We wanted Brass & Steel to arise organically from our own accumulated knowledge and imaginations. As the development process moved further along we spent a lot of time trying to ensure our game fit well into the genre while adding our own take on steam power, airships, and goggles. We knew there were a lot of passionate steampunks out there, a fact that has been repeatedly confirmed by the feedback we get, and we wanted them to love our game as much as we did. Then there is the “alternate earth” aspect of the game. One of the designers is a history professor. The rest of us are armchair historians and antiquarians ourselves so we had a good grounding in the history of the late 19th and early 20th century in our real world. It was very important to us to give a plausible historical backdrop to our steampunk world rather than simply getting to the mid-nineteenth century and steampunk happens. We wanted to craft a background timeline for our alternate Earth going back into antiquity, making the steampunk world of 1905 seem like the logical culmination of thousands of years of alternate history. However, it wasn’t just a historical thought exercise. We thought very hard about the ways we’d like to add to, subtract from and tinker with real world history to make a fun steampunk world that is believable and consistent, while still being full to the brim with opportunities for adventure and an interesting cast of potential adversaries. We’ve been very lucky when it’s come to art and art direction. Shawn Kavon is a graphic artist in his day job so the rest of us have been in awe from the beginning at what happens to our raw text when it goes through the Shawn filter and comes out the other side looking so great. The look and feel of the printed materials were influenced by the Art Nouveau/Arts and Crafts movement of the early 20th century which can be seen in the use of Nouveau scrolls, borders and ornaments. For color we continued with the Victorian period influence using earth tones of deep red, dark brown, golden yellow, sage green, and tan. For our commissioned art we tried to use our limited budget to capture key ideas. We brainstormed about what might be nice to have and then pared that list down to a few windows into our world. For example, we thought it would be neat to have an arcanist, a magician basically, in a Victorian-esque room using our magic/steam technology to do some research. That drawing ended up near the front of the book. We’re not sure what the message was, but when we got this one back from Grace Palmer, our main artist, the magician looked suspiciously like co-designer Greg Kveberg. First, Brass & Steel is designed to be easy to learn, fast-paced and very fun. All games should be fun, of course, but we wanted to make playing Brass & Steel feel like starring in an adventure movie with the players as the heroes. We wanted the rules to be complete enough that it felt like a game, where people rolled dice and calculated successes when it meant something, but we didn’t want to get bogged down in minutiae. So we made the system very easy – one die, one test for any resolution with simple math to figure out how successful you were when it mattered. Our desire to incorporate LARP play into the rules system without modification also drove this. We wanted players to be able to get quickly familiar with the system and from there rarely have to look at anything that wasn’t on their character sheet or our quick reference cheat sheets. We’ve heard that the game is probably most similar to Castle Falkenstein, though oddly enough were not familiar with that system at the start. Our history is somewhat more alternate, and our setting tends to be darker and grittier. Arcanism, for instance, is not really high-fantasy magic. It’s power with a very serious price tag attached – not exactly on the level of feeding one character per session to the books, but certainly power with serious risks and costs involved. We’ve also shied away from the more conventional fantasy elements – if you encounter a unicorn it’s the product of some twisted laboratory experiment or part of an elaborate hoax, not a gentle and noble companion. Other games that Brass & Steel might compared to are Abney Park’s Airship Pirates and Victoriana, which both use Cubicle 7’s Heresy system. The main difference we would draw between Brass & Steel and those products is in the setting. Airship Pirates is a time-traveling post-apocalyptic future setting and Victoriana is a fantasy setting with steampunk elements. We think these are both fine games, but a vital asset of Brass & Steel is that it is the only steampunk RPG we’ve seen come along recently that actually takes place in a largely historical Earth of the late Victorian era. Much of the tension in our setting derives from the real-world historical tensions between the great powers and their colonial ambitions at the turn of the twentieth century, adding steampunk elements to enhance and highlight the real world tensions leading up to World War One. Our setting takes full advantage of all the variety that real world history offers, in much the same way that the World of Darkness games, especially the Dark Ages line, were set in a “gothic punk” version of the real world. While developing Brass & Steel we’ve engaged in numerous free-form brainstorming sessions in addition to many face-to-face meetings and Skype conference calls. As an example of brainstorming sessions, the first glimmers of the arcanism and dreaming elements of the setting originated over drinks in shouted conversation about how awesome they’d be in a Goth-Industrial club. In the early months we were also creating an entirely fictional world that had suspicious similarities to Victorian-era Earth but we fairly quickly decided that an alternate history Earth was the better choice. The broad strokes of the setting were developed very quickly; what followed was the much longer process of refining that creative raw material into a publishable product. Very early on we settled on a short list of design priorities that would guide us through the whole process. The most pervasive of these priorities was that we craft a system which worked equally well for tabletop play and live-action play. Many ideas we had throughout the design process bumped up hard against this priority. The need to keep gameplay streamlined enough to work in a LARP but complex enough to be interesting in tabletop forced us to walk a game design tightrope. In the end, walking that tightrope resulted in a game which feels like a cohesive whole, avoiding the trap some games fall into of being a collection of disparate subsystems. We also brought very different takes on period society to the table. Our interests run the from top to bottom of the Victorian social order, with Shane being something of a guru on the elegant life of the English gentry, Greg being much more interested in the outcasts, revolutionaries, artists, and other disreputable folk and Ken being more interested in the history and culture of the Islamic societies of the Near East and their interactions with European colonialism. Those different views have worked together quite well, and enabled us to create a richer and more detailed world than we’d have been able to if our interests had been more similar. It’s been almost a year since we released our first edition and we’ve used the time to run events at various conventions, prepare a scenario for publication and fine-tune some of our concepts. One of the biggest challenges has been deciding what we should provide a bit more detail on right away and what will have to wait for the second edition of the game. We’ve recently released our 1.5 version, a minor update with some rules clarifications and the like, and our next priority is to get to Gen Con and run 11 fun tabletop games and a giant LARP. We had a lot of fun, and met great people interested in our game, running events last year and we hope to repeat the experience.